Jot down notes in the most convenient place – right under your hand! 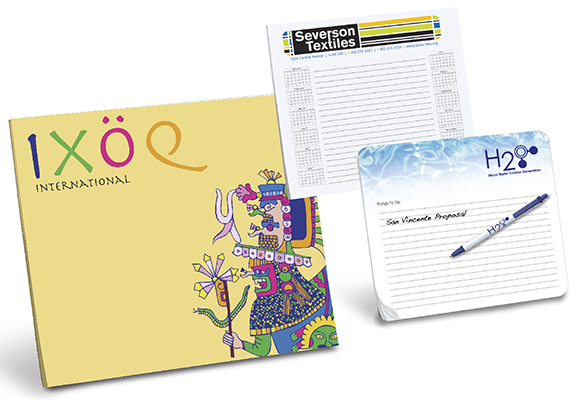 Includes 4- color process imprint and free set-up on a white 50-sheet pad with non-slip chipboard backing. Please send art to art@thediscountprinter.com after placing the order. Min. Quantity 200 - ($678.00) 3.39 ea. Custom Printed Paper Mouse Pads are the newest item in the promotional field. Fun for everyone and something that is used daily. From realtors to doctors to school kids, everyone uses mouse pads and the paper mouse tags are perfect not only for your computer mouse, but perfect for jotting things down and having them right at hands length. We custom printed the paper mouse pads in full color. Have anything you like printed on the pads. They come 50 sheets per pad, are standard mouse pad shape with or without rounded corners. Again, they are perfect for anyone. A perfect give-away for any event.